This summer, when you’re planning to lounge at the beach or relax in the park, take a new friend – a book, a magazine, a graphic novel – with you. While idling before an appointment, standing in line, or waiting for the bus, take out a book and read. Before rushing home after work, avoid heavy traffic and read a book. And don’t forget to pack a book for your children, your nieces and nephews, and young cousins. * The Hawaii Public Libraries Summer Reading Program, May 31 to July 18, 2015. Children, teens, and adults can read at least one book each week and earn cool prizes. There are three reading programs: “Every Hero Has a Story” for elementary students, “Unmask!” for teens, and “Escape the Ordinary” for adults. We can all read a book about a famous or significant person in history, write about the influential people in our lives, or even create our own superhero. * The Barnes & Noble Summer Reading program, “Imagination’s Destination,” May 19 to September 7, 2015. Elementary students in grades 1-6 can read 8 books, record them in the Reading Journal, and turn in their Reading Journal for a free book from the book list (there are stores located in Honolulu, Oahu and Lahaina, Maui). Download a free printable Summer Reading Kit to help kids keep track of favorite books, explore different genres, and more. * The Scholastic Summer Reading Challenge, a free online program that runs from May 4 through September 4, 2015. Kids can log the minutes they spend reading, play games, earn virtual rewards, and enter sweepstakes, all in an effort to set a new reading world record for summer 2015! What books will you read this summer? Where are your favorite places to read? Living together in extended families is not unusual in Hawaii. I grew up in a multigenerational household (though we didn’t call ourselves “multigenerational”). I lived with my father, aunt, and grandparents in a three-bedroom home. By sharing incomes, we were all able to live comfortably. My grandparents were a big part of my life, and even took me on my first vacation to Disneyland. There were always adults to look after me when I was young, and someone to run to if I was in trouble with someone else. The one drawback was that I couldn’t invite friends over –there just wasn’t room for more people. Later in life, my parents took care of my grandparents, who were able to “age in place” (another term we didn’t use). It was difficult; our 1950s single-walled construction home had a stairway to the living area, narrow doorways, and small bathrooms. No one thought about getting older when they built the home. * Everyone should contribute to household expenses and chores. In my family, everyone had a full-time or part-time job. My parents contributed money to buy groceries, household items, and gas. As a kid, I think that “homework” was one of my chores. * Everyone needs their own space. It doesn’t have to be a room. My grandmother’s space was outside in the yard, where she grew flowers and fruits. My grandfather’s space was a recliner, set right in front of the television, within reach of the remote control and the telephone. 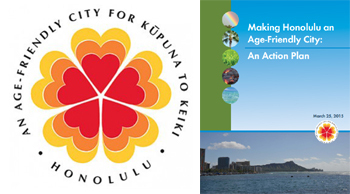 I was very interested to read the report on “Making Honolulu an Age-Friendly City: An Action Plan” (3/25/15), prepared the University of Hawaii Center on Aging. It’s specific to Honolulu, but the plan could be customized for other cities in Hawaii. According to AARP, an age-friendly city entails “an inclusive and accessible urban or suburban environment that encourages active and healthy aging.” The plan identifies six lifestyle “domains” – Outdoor Spaces and Buildings, Transportation, Housing, Communication and Social Involvement, Civic Participation and Employment, and Community Support and Health Services. For each domain, it identifies a vision and goals; offers a snapshot of Honolulu today; outlines strengths, gaps, and challenges; highlights opportunities for improvement; and recommends actions. The comment period has already closed, but I encourage you to read the action plan. Some of the practical recommendations include clean, well-maintained public restrooms; well-maintained streets and more frequent bus service; more affordable housing (including accessory dwelling units, cohousing projects, multigenerational developments, and micro-units); more community programs and adult education; affordable health care; and elder care training for families. I really like the efforts to create multigenerational projects, such as housing that pairs seniors and college students; and education that pairs seniors and school children. In general, the plan recommends increased police presence in high-crime and high-accident areas; greater use of social media, apps, and “awareness” campaigns; and more community involvement, in the form of community ambassadors, “Citizens on Patrol,” and a volunteer corps for park and restroom maintenance. I understand that this is an action plan, not an implementation plan, but three things are missing: 1) the estimated costs involved and funding sources; 2) a priority list sorted by “must-haves” and “nice-to-haves”; and 3) a fast-track list of things that can be done quickly and economically. Let’s see what the Honolulu City Council and the Hawaii legislature do next. Have you lived in a multigenerational household, or are you planning to? If you have, what challenges have you faced and are their unexpected benefits? If not, what would make you consider living with your parents or children again? May is National Inventors Month, a month-long event celebrating invention and creativity. 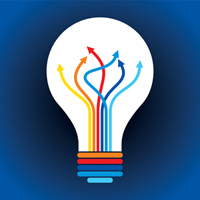 National Inventors Month was started in 1998 by the United Inventors Association of the USA (UIA-USA), the Academy of Applied Science, and Inventors’ Digest magazine to help promote the positive image of inventors and the real contributions they give to this world. * Make a “What if?” list. Challenge yourself to change the way we do things. The article “Create an Invention!” on Education.com can help you get started. * What inventions could you live without? Teach-nology.com has an interesting worksheet called “I Can Live Without It!” It can help you simplify your life, practice debating and persuasion skills, or just poke fun at some of the wacky inventions people come up with. * Scholastic.com has a series of mini-lessons for kids: What is an invention? Inventions all around us! Top 10 inventions. And Inventions for the 21st century. Just for fun, here’s a creative invention that turns snow into ice cream, drawn by my son when he was 7 years old. He’s only seen snow on “snow days” at school, but he really likes ice cream. 1. Transportation: Transporters (Star Trek). According to the StarTrek.com database, a transporter is a “Transportation device that converts objects or persons to energy, sends that energy to the destination, and reconstitutes the objects/persons back into matter.” This would bring the world closer together. People and goods could travel immediately from one location to another. This is especially critical in emergency situations and remote areas. 2. Transportation: Resonating Bridges (Anne Bishop’s Ephemera” series). “Stationary bridges linked one or more specific landscapes and were usually a reliable way of crossing over from one landscape to another. Resonating bridges allowed a person to cross over to any landscape that resonated with a person’s heart.” In effect, you can either end up on the other side of the bridge or end up in a location where you feel more comfortable. These bridges can be dangerous, because you may not find your way home again; but they are also an opportunity to change your life and a way to enact justice. 3. Communication: Mirrors (Michelle Sagara’s Elantra series). Mirrors are functioning mirrors (you can see your reflection) and communication devices with audio, video, and recording functions when activated. They also act as Records (computers that accept verbal commands to search library records). There would be privacy and security concerns about mirrors, but they would be a great resource in criminal investigations and I like their practical nature (they hang unobtrusively on the walls). 4. Communication: Scrybowls (Robin Owens’ HeartMate series). A scrybowl is a communication device in the shape of a large bowl. It is functional artwork with audio and video capabilities, and can also transport small objects (plants and objects that can fit into the bowl). Obviously, larger scrybowls can broadcast larger videos and receive larger objects. Scrybowls let you control who has access to your number, whether to turn on the video broadcast, and what objects you can receive. 5. Self-defense: Whipswords (Arwen Elys Dayton’s Seeker). In a more perfect or controlled world, we wouldn’t need weapons; but if you do need to defend yourself… A whipsword is a weapon and training device that can shape itself into different weapons with just a thought, such as a whip, long sword, claymore, scimitar, or dagger. As a weapon, it will harm everyone except the bearer; as a training tool, it cannot harm anyone. It is made of an oily black substance that liquefies during transformations. I like the creativity, quick-thinking, and versatility that you need to master the whipsword. What inventions are you most grateful for? What inventions do you wish you could use today? Imagine relaxing with a book you’ve been waiting to read… or talking story and thinking that your family stories would make a great book… or heating up the grill for a beachside barbecue before hot summer days. May is a month for reading, writing, and barbecuing. For readers, May is Get Caught Reading Month, a nationwide campaign to remind people that reading is fun. Celebrities like actor Cary Elwes, authors like Neil Gaiman, and even Yoda have been caught with a book. If you don’t have a lot of time, DailyLit will email you 15 minutes of fiction every day. You can fill “between-time” moments waiting for the bus, a train, or an appointment with a book, comic book, or graphic novel. In the classroom, ReadWriteThink has some great resources for teachers and librarians to encourage reading – like choosing the right book or discussing books about courage. Libraries could set up a “Get Caught Reading” book club. This is a great warm-up for summer reading programs, which start later this month. If you’re looking for great Hawaii reads, check out the 2015 Ka Palapala Po’okela Award nominees and winners, selected by the Hawaii Book Publishers Association. I recommend Darien Gee’s “Writing the Hawaii Memoir” – it combines reading, writing, and bento boxes. For writers, aspiring writers, and family historians, May is Short Story Month. Instead of waiting to write that novel, start with a short story or essay. StoryADay.org has even come up with an annual Extreme Writing Challenge: Write a story everyday in May! If you’ve heard a good family story or shared a funny moment with your friends, consider writing it down (you can always change the names in your story to protect the innocent – and not-so-innocent). When I was in elementary school, one of my teachers assigned us to write one page every night for homework. Usually she gave us a creative writing prompt. Sometimes I didn’t know what to write, so I did what kids usually do: wrote large and used big margins. Mostly I enjoyed writing, and even challenged myself to write “serial” stories – a 5-part story with cliffhangers. I wish I had kept them. And because good books go with good food — for foodies, picnickers, and beach-goers, May is National Barbecue Month. Celebrate grilling and the outdoors with a potluck, a beach BBQ, or picnic. For outdoor cooking ideas and tips, read the “BBQ 365 Guide” from the Hearth, Patio, and Barbecue Association (HPBA). I’m not a grilling enthusiast, but I live with one. He loves his Kamado, and he knows how to use it. One of the most useful tools I gave him is a set of branding irons for steaks – “R” for rare, “M” for medium, and “W” for well-done. What books will you read this month? What stories will you tell? And just as important, what will you barbecue? If you have a favorite BBQ recipe, please share it with us! “I want women and girls to believe in themselves just as much as men and boys do. 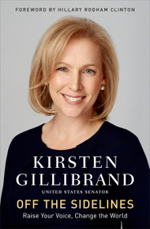 I want them to trust their own powers and values,” (page xiv), lawyer Kristen Gillibrand writes in her book, “Off the Sidelines: Raise Your Voice, Change the World” (2014). With honesty and passion, she shares her journey of becoming a New York senator while coping with pregnancy, motherhood, and judgments on her appearance. Gillibrand reveals the strong female role models in her life: her grandmother Dorothea “Polly” Mclean, who organized election campaigns and volunteers in Albany, New York and who taught her “the bedrock lesson of life: be exactly yourself”; and her mother Polly Rutnik, a lawyer who juggled career and family. Gillibrand got her start in political life by joining the Women’s Leadership Forum in New York City. Through sheer persistence she gained face time and phone time with former First Lady and Senator Hillary Rodham Clinton, and decided to run for US Representative in 2006. When Hillary Clinton was appointed Secretary of State, Gillibrand was appointed to replace her as US Senator. “Don’t be afraid to fail. Failure is instructive and necessary. Winning is great, but quitting is how you really lose” (page 21). Whether you are competing against a stronger opponent or taking on an issue you believe in, don’t fail before you even try. “When you believe in a cause, you aren’t picky; you just help” (page 29). When you support a candidate or issue, do whatever needs to be done, however small. Help where you can. If you run for elected office, get to know all of your neighbors, speak to everyone you can, and ignore negative press. The first rule of being an elected officer: protect your family. Put your family first when you schedule your time. “Good ideas don’t come from Washington. They come from individuals willing to share their experiences and needs” (page 60). Persistence works. “People notice and admire tenacity” (page 65). If you have the chance to meet a mayor, a governor, a president, or a CEO… make every second count. Plan what you want to say and make contingency plans. “Be kind to others and build relationships most when no one is watching, because that is when you are your most honest and genuine self” (page 89). Picture success – but don’t overschedule yourself. Set aside time to relax and re-energize. Hold on to your friendships. Friends keep you centered and give you chances to support them in return. Do you know who your US representatives and senators are? Which political figures or government representatives do you admire? You are currently browsing the Better Hawaii weblog archives for May 2015.